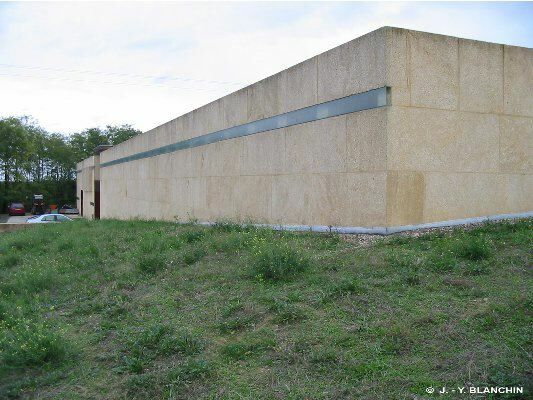 Address : GAEC Les Aurelles 34320 NIZAS HERAULT (FRANCE). Photography : © CAUE du Loiret ; Jean-Yves BLANCHIN. 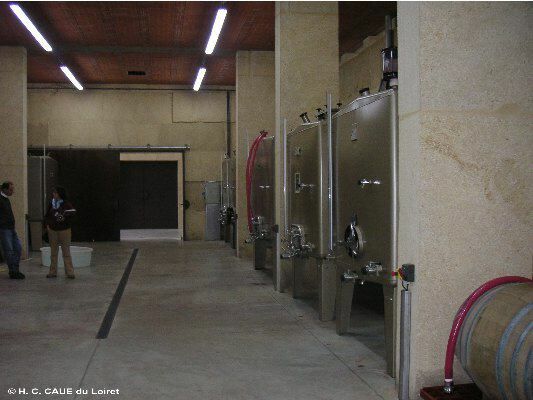 The Aurelles GAEC makes a certified organic AOC wine ‘des coteaux de Languedoc’. The wine is produced in limited quantities (3500 bottles per year) and is destined for use in restaurants and ‘belles caves’. Conscious of the importance of the public image of the label, but also wishing to reinforce a coherent image to his vineyard at Bazile Saint-Germain, the client imagined with the architec Gastaldi a building which respects the environment both in its insertion into the site and its functionality. 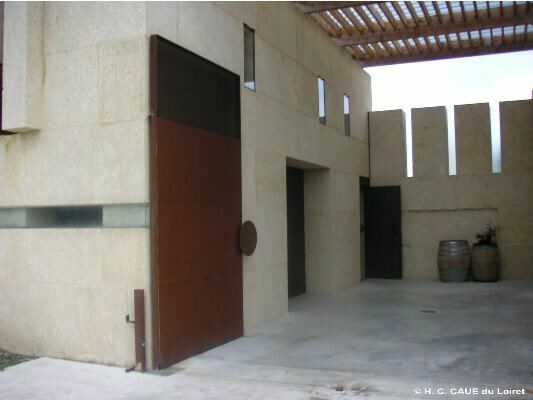 The building, conceived by Gilles Perraudin, is built in solid stone for environmental reasons. 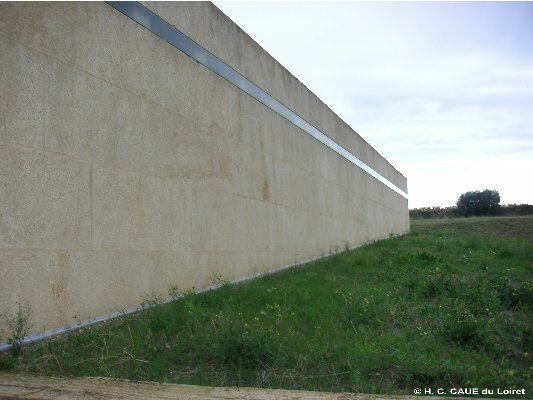 The insertion of the building into the slope, in association with the use of stone which is interlaced with natural limestone, a vegetable roof and a natural ventilation/cooling system, bestows the whole with a stable thermal environment. 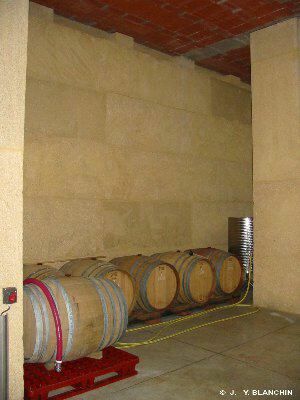 Taking these elements into account, the entire facility benefits from an atmosphere perfectly adapted to the creation and the conservation of wine in a natural way, much as would a troglodyte type wine cellar. Blocks of chalk (2,20 X 0,75X 0,90 m) fulfil the role of structure, external cladding, internal cladding and thermal and acoustic insulation. This module, used specifically throughout the building, is responsible for the architectural rigour of the building, stripped of all embellishment. 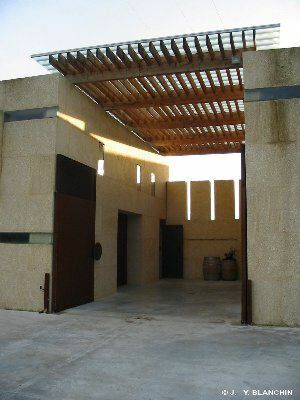 From a functional point of view, the building makes reference to traditional vineyard models by placing the winemaking elements within one part of the edifice and the storage, offices, laboratories and workshop-garage in the other. In spite of the limited are, the building appears to have a monumental aspect and appears ‘timeless’ while also exuding a contemporary aspect which draws on ideas of sustainable development. Nevertheless, situated at the limits of the village, the winemaking facility is, little by little, being surrounded by a recent housing development which lacks in character. This could be qualified as ‘visual pollution’ which is detrimental to the care taken in the conception of this building into its environment.